Professional photo and 4K video performance in a durable magnesium alloy body. / 20.3MP Four Thirds sensor with no low pass filter. Full size (Type A) HDMI terminal with cable lock included & twin SD Card slots (UHS-II U3 Compatible). 4K Video: Internal recording at 4K60/50p (4:2:0 8bit) & 4K30/25p/24p (4:2:2 10bit). / Variable Video Frame Rates 4K: Max. 60fps & FHD: Max. 180fps. 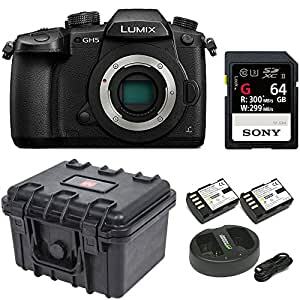 The diecast, magnesium alloy frame of the Panasonic Lumix GH5 4K is compact and lightweight yet extremely durable. When it comes to built quality, this micro-four thirds camera body is built like a tank. It’s freezeproof down to -10 degrees and features weather sealing in every joint, dial and button so it’s also splashproof and dustproof. The rugged body of the Lumix GH5 means you don’t have to interrupt a photography session to come in out of the rain. Take it anywhere with you and experience peak performance in any environment! Recording at faster frame rates produces excellent motion compensation and the Lumix GH5 shoots silky smooth 4K video at a whopping 60p/50p (QFHD 4K: 3840 x 2160 / MOV or MP4). You can also slow down footage inside your video editing timeline without losing detail and achieve perfect panning control.